“Nazis . . . I hate these guys.” Indiana Jones, Raiders of the Lost Ark. As a study in microcosm on how the Nazi Party obtained and maintained the support of the German people, consider the town of Thalberg, Germany, in 1930. At that time, Thalberg, was much like other German communities in its makeup, temperament, and productivity. Thalberg’s population of approximately 10,000 was largely comprised of petite bourgeoisie, the primary source that Adolf Hitler drew support from for the Nazi movement. Most of the middle class were employed by the civil service, and whose livelihood depended on a strong government. As a result, the citizens of Thalberg were less likely to oppose a government in power that maintained a large bureaucracy (Allen 15). The people of Thalberg were active in both work and social activities. Seventeen guilds represented 150 small shops. These guilds would organize and cooperate in social ventures like construction of housing for the homeless. A majority of the 161 clubs and organizations were military fraternities, veteran support groups, and women auxiliaries (Allen 19). Militarism as a social phenomenon in Germany was alive long before Hitler was even born. Flanked by France and Russia and hemmed in by British dominance of the seas, Germany historically was in a position much like ancient Sparta. With enemies all around, a strong military was required in order to exert some measure of self-determination; indeed, Germany was the first to introduce conscription. A further consideration is that Germany was not unified until 1870. Due to the late date of unification, and bounded on all sides by perceived enemies, Germans subsequently became suspicious of foreigners (Allen 23). This widespread German xenophobia became a driving force that brought the Nazis to power. The secret of Hitler’s appeal to the conservative petite bourgeoisie in a town like Thalberg is that his attraction spanned class and gender. The Nazi Blood and Soil (Blut und Boden) ideology, which Hitler tied to the Nordic past, appealed to farmers. To the young, Hitler was a father figure. To the poor, Hitler’s indigent, homeless youth made him one of their own. To the officer corps, Hitler was the commander-in-chief. To the regular infantryman, Hitler was a former lance corporal who knew the dangers of front-line service. To the cultured, Hitler was an artist, architect, and an opera aficionado. To business, Hitler spurred economic growth with lucrative public works projects and military contracts (Grunberger 26). With Hitler at the head of a centralized government, one would think that the populace would be quick to blame the Führer for Nazi extremism; however, just the opposite occurred. Nazi party heads were given relative carte blache to enforce the rules of the Reich; consequently, the resulting “excesses” could always be blamed on over-ambitious “little Hitlers,” as they were referred to. The people then could be confident that “If only Adolf knew about this,” he would set things right (Grunberger 26). We can see this Führer-forgiving attitude reflected in the German middle and upper class concern over the violence of the brown-shirted S.A. under Ernst Rohm, and the resulting support the public lent Hitler following the Night of the Long Knives in 1934. Similarly, in small towns such as Thalberg, far from the seat of political power, Hitler remained a stern father figure in control of a burgeoning new empire, but also somehow clueless to its crimes. This dichotomy suggests a German awareness of their own culpability, but also a mass dissociative disorder, absolving themselves from responsibility by also absolving Hitler. After all, if Hitler did not know, how could they then also be responsible? The Nazi Community of the People Segment from Hitler: The Whole Story (1989 Cine-Art/Munich). Germany, driven by a desire for an expanding empire to match those of Austria, England, France, and Russia, and unable to achieve it, had a sense of national inferiority, emotions which would lie at the root of two world wars. In Milan, an Italian threw a rock through a window and ran. In Leeds, an Englishman wrote a very nasty letter to The Times, the resulting debate in Parliament ended with the fall of the government. In Austria, the trolleys were in such bad condition that even though the windows were closed a nice breeze came in anyways. In Nebraska, an American opened a window despite the rules. These particular reactions reflect the personalities of European nations at the time. While physical abuse is a common dysfunction, in Germany, it mixed with a cultural tendency towards submission to authority, creating a cycle of violence where the victims grow up to become the victimizers, committing the same crimes visited upon them in an increasing volume. The youths of Hitler, Himmler, and other top Nazis were marked by abusive fathers. So widespread was this type of “parenting” that the resulting natural antagonism corporal punishment creates in children was exploited by the Nazis to sever the bonds between parent and child, and reaffirm the bonds between the child and the state (Zeman 78). Fig. 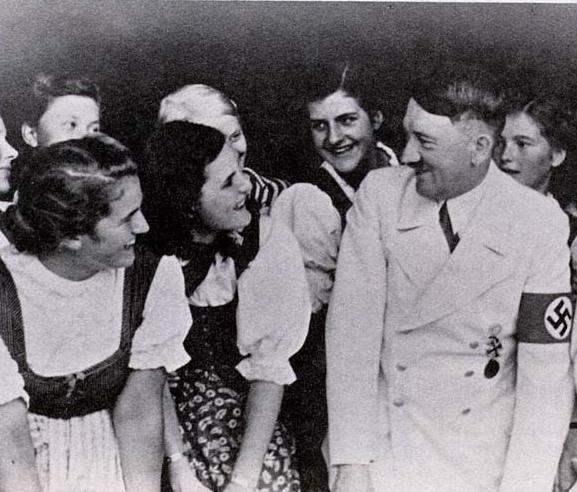 2: Hitler Youth Schoolgirls from Berchtesgaden School with the Führer. Despite his smile, Hilter’s body language here suggests a tense and protective posture. The German family identity was formed by 1,000 years of strong authoritarian princes and kings who ran their nation-states in the same manner in which they ran their families. The short-lived Weimar Republic, which lasted 14 years, from 1919-1933, was perceived by many Germans to be destroying traditional German conservative values. Fourteen years of democracy would not be enough to off-set one thousand years of authoritarian rule. When the Weimar Republic failed to solve the problems brought on by the Depression and its unemployment and staggering inflation, the Germans began to look for a father-figure, a “strongman” to restore their economy and self-esteem. The inclination to submit to authority was conditioned into the Germans culturally via their history and traditions. Hitler was able to sense the psychological needs of the German people and manipulate them to his own ends (Seltzer 220). To advance his personal agenda, Hitler focused German xenophobia on various scapegoats to divert attention from his war aims (as most Germans were opposed to war). In doing so, Hitler was able to eliminate his only real competition for political power, the communists. Since the communists allowed in Jews, Hitler found further cause to isolate this long-suffering European minority (Artieti 284). The Lutheran Church in Germany was historically steeped in anti-Semitism. Indeed, Martin Luther himself was a notorious anti-Semite. Considering that 83-percent of German in 1930 were Lutheran, it is little wonder then why this facet of Nazism was embraced by Germans (Artieti 288). By attacking the Jews, Germans began to gain a sense of self-determinism, and as their confidence grew, so too did Hitler’s rise to power. The town of Thalberg in early 1933 reflected the dynamics of political and cultural pressures being exerted on the German population to fall in line behind the Nazi banner. Since drastic measures were needed to rectify the worsening economic conditions, supporting Hitler for chancellor seemed a logical step. Still, while Hitler received little more than one-third of the popular vote, the opposition was divided and this allowed Hitler to maneuver himself into the chancellor’s position. Once in office, Hitler was able to acquire the powers to deal with the economic situation by advancing public works projects and legislation favorable to German business. Hitler eliminated the communist threat following the burning of the German Reichstag in 1933, he removed the challenge to his authority by the Brown Shirts on the Night of the Long Knives in 1934, and the Jewish Holocaust was already well underway by Kristallnacht in 1938 (Grunberger 298). Financed by the seizure of the property and wealth of his enemies, Hitler solidified his power throughout the German peoples’ community. Mandatory enrollment in the Hitler Youth, spreading Nazi ideas throughout the education system, control of the press, taking over programs started under the Weimar Republic, such as the Autobahn and re-education camps (Grunberger 26), and related measures, restructured the social order along ideological lines (Dietrich 286). While ostensibly trying to connect Germans to their past by restoring ancient traditions, Hitler was, in fact, rewriting the past to meet his own sociopathic needs. The will to survive in desperate times can overcome even the most reasonable people and in Germany in 1930 that desire was nearing an apex. Hitler sold Germans on the need to form into a tight, homogenous community for survival; however, in the process of becoming part of something greater then oneself, individual will is lost, submerged into a mass consciousness. The sense that we are part of something larger than ourselves reinforces the idea that we are basically insignificant as individuals. Tapping into that psychology allowed Hitler to command the loyalty of a population prone to complying with authoritarian regimes. The Nazi's used a combination of politics and social programs to bend the natural tendencies of the youth towards the National Socialist agenda. From Hitler: The Whole Story (1989 Cine-Art/Munich). The position put forth by Shakespeare, which reflected the European notion of personal responsibility under an authoritarian regime, is that loyalty is perceived as a saving grace, even if the king demanding that loyalty acts dishonorably. Here then, we see a cultural tradition that bound the ruler and the ruled together, for better or worse. One contributing factor to Hitler’s hold over the German people was the cultural importance of the personal oath as a point of honor. A leftover of feudal society, this was a common factor to both the Germans and their Japanese allies, not long out of their own feudal period. Hitler took advantage of this by demanding the military take an oath to him personally, rather than to the state itself, putting the cause of the Fürher above the good of the fatherland. Hitler took this one step further and demanded the loyalty in even the most mundane matters. In a scene almost out of an episode of Monty Python’s Flying Circus, German sporting officials would visit local cycling clubs, such as one might find in Thalberg, to proclaim, “The Fürher demands the unity of the whole German cyclists’ movement” (Grunberger 95). In a totalitarian society, any group of private citizens organized around a common interest has a base from which to organize for a political purpose. Indeed, the Nazi party itself started out as a group of middle-class shop owners and craftsmen. By demanding loyalty at every level in society, Hitler not only bound the people closer to him, but made them complicit in his crimes as well. 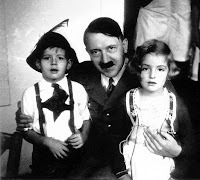 The Germans could not abandon Hitler because if he was going to hell, so were they. Defeat meant damnation; it was, literally, victory or death. Once unleashed, a community united by a common ideology and purpose is capable of significant accomplishments. Indeed, if you were Aryan, the Nazi community was for many years a productive and positive experience. With the benefit of hindsight, we bemoan the loss of the individual, but the Germans of the time, and indeed many Europeans, were used to the “strong man” model of government, be it monarchy or maniac, and sometimes both. While we pin the blame for World War on Hitler, we must remind ourselves that he came to power because he fulfilled a basic, primal need in the German peoples’ community. In the mid-war period of 1919 through 1939, there were thousands of small towns across America much like Thalberg, both economically and ethnically. Many Americans at the time came from families that were no more than a generation or two removed from their European countries of origin. Americans and Europeans shared many of the same dreams and fears, yet like that hot summer day on June 14, 1907, each responded in a way that was in keeping with its national character. Still, one cannot gaze into another community without seeing shades of similarity within our own. The depredations by the U.S Army on Native American tribes during the period of Westward expansion at times matched the ferocity of the Nazi persecution of Jews and other minorities. Indeed, the Nazis drew inspiration for the German Sterilization Law of 1933 from similar laws passed by various American states in the 1930s as well as laws in Finland, Norway, and Sweden (United States Holocaust Museum). The Klu Klux Klan expanded its membership to over two million members in the 1920s, at a time when fascism was spreading not only throughout Germany, Italy, and Spain, but to a lesser degree in Britain and France as well (Wormser). Segregation persisted in various southern states in America through the 1960s. Many of same conditions that Germany faced after World War I - the Depression, ethnic and racial conflicts, economic class warfare, and far-left and far-right political movements — were also experienced in Great Britain, France, and the United States. Nevertheless, it was Germany, Italy, Spain, and Russia, that fell victim to the chaos, and consequently sought to spread that chaos to justify their own political existence. It might well be that the Western Allies in World War II just managed to avoid falling into the abyss that consumed the Axis powers with nothing more than luck and a tradition of democracy that serves to check the worst excesses of human nature. . . sometimes. division of Franklin Watts: New York, 1973. Print. Vol. 9 (3) (Sept. 1988): 385-411. Print. Hitler: The Whole Story. Cine-Art/Munich, 1989. VHS. “Klu Klux Klan.” Jim Crow Stories. PBS Online, 2002. Web. 1 Nov.
Chicago Press: Chicago and London, 1966. Print. Museum, 6 Jan. 2011. Web. 1 Nov. 2011. Oxford, New York, 1973. Print.